"With Phytoceramides Premium™ my skin is shiny and wrinkle free!" Wheat extract oil was shown in clinical studies to reverse the signs of aging, while replenishing moisture and repairing skin damage. We're so confident that Phytoceramides™ will work for you that we are offering a 90 day Money Back Guarantee! So, feel confident that it will work for you*, or your money back! "Not All Phytoceramides Products Are Created Equal." Before you buy a Phytoceramides supplement, it's important you know what you're buying. Fly-by-night supplement makers are rushing to create their own product and "cash-in" on this huge skin care craze. So take your time and read the label carefully. Beware of manufacturers who claim to have the best product on the market. The reality is that most Phytoceramides supplements do not live up to their claims. They are not developed with the manufacturing standards and optimal dosage found to be most effective in clinical studies. To maximize your anti-aging results, make sure you buy quality Phytoceramides supplements that meet all of the recommended criteria. Why Is Phytoceramides the Hottest Skin Care Supplement Today? A few years ago, no one ever heard of Phytoceramides. Now, Phytoceramides is a new leader in the skin care world. In a recent study published in the International Journal of Cosmetic Science , scientists used 350mg of wheat extract oil to research its effect on skin repair and rejuvenation. The clinical study supports the positive effect that wheat extract oil has on the reversal of fine lines and wrinkles, as well as skin repair and moisture replenishment. You can see the full clinical study by Clicking Here. It's important to note that 350mg of wheat extract oil daily was used in the study (exactly as found in Phytoceramides Premium™), not a synthetic wheat extract oil. Phytoceramides Premium™ contains 350mg of wheat extract oil, which clinical studies show is the optimal dosage to reverse the signs of aging. Don't Get Fooled When Buying Phytoceramides! There is a lot to watch out for when buying Phytoceramides supplements. For your convenience, we summarized the most important factors to look out for. You can see what the recommendations are and where our product stands compared to others on the market. Does the Phytoceramides supplement contain wheat extract oil? Wheat extract oil is essential in fighting fine lines and wrinkles. Does the Phytoceramides supplement contain Vitamin E? Vitamin E protects your skin from fine lines, wrinkles, moisture depletion and skin damage. Make sure you are taking the optimal 350mg daily dose to reverse the signs of aging. It must contain wheat extract oil. It must contain Vitamin E.
It must have no fillers, binders or any additives. It must be 100% pure and packaged in a vegetarian capsule. You must take at least 350mg a day (Taken once a day). Make sure the supplement is made in an approved registered laboratory. YES, Phytoceramides Premium™ meets all the above Criteria: It does not contain fillers, binders or any additives and has a serving size of 350mg daily. It is manufactured in an approved registered and cGMP certified lab, which complies with US Pharmacopeia's quality standards. Phytoceramides Premium™ compared to the leading brands in the industry. Phytoceramides Premium™ was created to meet the growing demands of consumers for a high quality supplement at the best possible price. Phytoceramides Premium™ was formulated with the doctor's recommendation and clinical trials in mind. Phytoceramides Premium™ is 100% pure, and contains wheat extract oil, the most effective ingredient in fighting fine lines and wrinkles. At Phytoceramides Premium™, we never use false claims or misrepresent the facts. We tell you about what's out there, what's working and why. We only quote from real clinical studies. And we will never put you on an auto-ship program. We don't believe in them. You will be billed one time and that's it. What Sets Phytoceramides Premium™ Apart From Other Products? Phytoceramides Premium™ contains 350mg of wheat extract oil. Phytoceramides Premium™ contains Vitamin E.
Phytoceramides Premium™ contains no fillers, binders or any additives. Phytoceramides Premium™ is 100% pure in a vegetarian capsule. Phytoceramides Premium™ recommends a daily dose of 350mg (taken once a day). Phytoceramides Premium™ is manufactured in a cGMP certified facility. If you believe that Phytoceramides Premium™ meets all the criteria of a high quality Phytoceramides product and you're serious about reversing the signs of aging, then don't settle for cheap imitations. Try Phytoceramides Premium™ today and learn why we believe it's one of the best ways to reduce the appearance of fine lines and wrinkles for most people. It also comes with a 100% money back guarantee because we are confident that you will get results or your money back! What are Phytoceramides & How Do They Work? Only Quality Phytoceramides Will Help You Reverse the Signs of Aging. OK, first things first- it is important to understand that not all Phytoceramides supplements are created equal. Only a high quality Phytoceramides product is going to get you the results you are looking for. Specifically, the most effective Phytoceramides supplement contains wheat extract oil and has at least 350mgs per serving (taken once a day) with no fillers, binders or additives. Why 350mg of Phytoceramides daily? That is the result found most effective during the clinical study found in the International Journal of Cosmetic Science. Anything less will have a reduced impact on your anti-aging results. What are Phytoceramides and how do they work? Our bodies contain ceramides, which are found within the lipid layer of skin, and help retain tissue moisture for continued hydration. Ceramides also keep skin elastic, smooth and youthful. As you start to age, you begin to lose ceramides, which leads to fine lines, wrinkles, skin damage and dryness. However, ceramides can be extracted from wheat, and taken as a supplement to increase your ceramide levels and erase fine lines and wrinkles, repair skin and add hydration. What is the Key to Reversing the Signs of Aging with Phytoceramides? The key to reversing the signs of aging and erasing fine lines and wrinkles is wheat extract oil and Vitamin E, as found in supplements like Phytoceramides Premium™. Research has documented the power wheat extract oil has on increasing ceramide levels in humans and reversing the signs of aging, moisture replenishment and skin repair. Wheat extract oil contains high dosages of Vitamin E, which is an essential vitamin for fighting fine lines and wrinkles, while also replenishing moisture and repairing skin damage. While many skin care supplements exert only one effect on the body, Phytoceramides Premium™ sets itself apart as a dual-action solution that not only prevents wrinkles, but also offers skin repair and re-hydration. We begin to lose ceramides as we age causing fine lines, wrinkles and skin damage. However, ceramides can also be found in plants such as wheat, and when extracted and formulated into a supplement can effectively replenish ceramide levels in humans and reverse the signs of aging. Plant based ceramide extractions allow for the increase in human ceramide levels. By increasing our ceramide levels we can see a reversal of fine lines and wrinkles, as well as moisture replenishment and skin repair. What's the Science Behind Phytoceramides? Phytoceramides supplements are safe and have been proven effective in clinical studies. However, some manufactures develop inferior products that reduce the effect these supplements will have on your skin care goals. A widely reviewed clinical study of Phytoceramides was published in International Journal of Cosmetic Science, where they researched the effect of 350mg of wheat extract oil on skin repair. The clinical trial supports the positive effect that wheat extract oil has on the reversal of fine lines and wrinkles. You can see the full clinical study by Clicking here. So, to recap, a premium quality Phytoceramides product works to replenish ceramide levels in the human body, which allows for the reversal of fine lines and wrinkles, as well as moisture replenishment and skin repair. Wheat extract oil is the ultimate extract to help you reverse those signs of aging because it contains high dosages of Vitamin E. It has been all over the news for a reason. But, make sure you only buy a premium Phytoceramides product, with Vitamin E, that will actually help you erase those fine lines and wrinkles, not just some powder in a pill. Does Wheat Extract Oil Reverse the Signs of Aging? Phytoceramides has become the "It" Skin Care Supplement, thanks in part to America's most famous TV doctor describing Phytoceramides as "Faking a Face Lift." This new skin care supplement has the ability to reverse fine lines and wrinkles, while also providing skin repair and rejuvenation. Phytoceramides is unlike any other anti-aging formula on the market right now! The most prominent clinical study on Phytoceramides, published in the International Journal of Cosmetic Science , specifically uses a 350mg dosage of wheat extract oil, as can be found in Phytoceramides Premium™. The clinical study was a randomized, double-blinded, placebo-controlled human study conducted on women between the ages of 20 and 63. The study included 51 participants who had dry to very dry skin. The clinical trial divided the 51 participants into 2 groups, a Wheat Extract Oil group and a Placebo group. At the end of the study, the Wheat Extract Oil group had a significant increase in skin hydration and an improvement in itching, squamae, roughness and redness. The clinical trial proved that the ingestion of 350mg of wheat extract oil daily during a 12-week period was shown to favorably affect the skin, increasing skin hydration levels. To be clear, this study specifically used 350mg of wheat extract oil daily , which can be found in Phytoceramides Premium™. If you are going to buy a Phytoceramides supplement, make sure the label reads 350mg. Why is Phytoceramides Premium™ the #1 Choice for Skin Care? Phytoceramides Premium™ contains wheat extract oil which is the Key for anti-aging results. Phytoceramides Premium™ has Vitamin E a key vitamin to fight fine lines and wrinkles. Phytoceramides Premium™ is 100% pure with no added fillers, binders or additives. Phytoceramides Premium™ has no additional ingredients. Phytoceramides Premium™ is made in a 100% vegetarian capsule. It is manufactured in a cGMP certified facility. We're proud of Phytoceramides Premium™ and believe it is the most effective Phytoceramides supplement available. And we are so happy that so many of our customers agree with us! So, if you reversed the signs of aging using Phytoceramides Premium™, tell us about it! We would love to hear from you! -- Please Select a Subject -- I have a question about how to order Phytoceramides Premium. I have a question about Phytoceramides Premium. What is the status of my order for Phytoceramides Premium. I would like more information on Phytoceramides Premium. I would like to tell you about my results with Phytoceramides Premium. I need to update my shipping information for Phytoceramides Premium. I wish to return or cancel my order of Phytoceramides Premium. 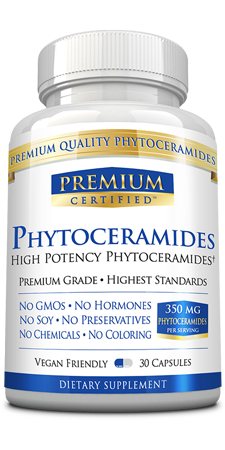 I want wholesale/reseller information regarding Phytoceramides Premium. 1. Why Choose Phytoceramides Premium™? Phytoceramides Premium™ is the highest quality brand for Phytoceramides. We keep everything transparent and don't hide behind our label or our website. Plain and simple, we provide the best Phytoceramides supplement at the best prices. We never use false claims and will never bill your credit card for anything you didn't order - no auto-shipping! Phytoceramides Premium™ was made to meet all of America's most famous TV doctor's criteria and go above and beyond them to make sure you get the absolute best Phytoceramides product. Phytoceramides Premium™ is formulated using wheat extract oil which is the Key to erasing fine lines and wrinkles. Phytoceramides Premium™ has 30 capsules per bottle. Phytoceramides Premium™ has 100% pure with no added fillers, binders or additives. Our bodies contain ceramides, which are found within the lipid layer of skin, and help retain tissue moisture for continued hydration. Ceramides also keep skin elastic, smooth and youthful. As you start to age, you begin to lose ceramides, which leads to fine lines, wrinkles, skin damage and dryness. However, ceramides can be extracted from wheat, and taken as a supplement to increase your ceramide levels and erase fine lines and wrinkles, repair skin and add hydration. While many skin care supplements exert only one effect on the body,Phytoceramides Premium™sets itself apart as a dual-action solution that not only prevents wrinkles, but also offers skin repair and re-hydration. It varies with each person. For some it can take as little as one week, while for others it may take up to one month to see results. Clinical studies recommend that you take 350mg - taken once before meals. Each bottle of Phytoceramides Premium™ is a 1 month supply of 30 350mg capsules. 5. Can I see the Label of Phytoceramides Premium™? Phytoceramides Premium™ only has wheat extract oil Phytoceramides, which is what America's most famous TV doctor recommends. Phytoceramides™ has no added fillers, binders or additives. Every capsule is encapsulated in a vegetarian capsule. 7. Are there side effects associated with taking Phytoceramides Premium™? There are no side effects to taking a Phytoceramides supplement. You also want to make sure you do not exceed the recommended dose. 8. Will Phytoceramides Premium™ really help me reverse the signs of aging? While every person is different, clinical studies have shown the effectiveness of Phytoceramides extract erasing fine lines and wrinkles. But results will vary per person. 9. Can I take Phytoceramides Premium™ if I'm on other medications? Phytoceramides Premium™ uses only the highest quality Phytoceramides extract. There are no known interactions with any medications, but that said, we recommend that you consult with your primary care physician if you have any concerns. 10. Where can I buy Phytoceramides Premium™? Phytoceramides Premium™ is only available online. You can order Phytoceramides Premium™ from our order page by clicking here. 11. When will Phytoceramides Premium™ be shipped out? All orders of Phytoceramides Premium™ are shipped out within 24 hours unless it is a postal holiday or the weekend (after 10am on Friday). 12. Is it safe to order Phytoceramides Premium™ online? Yes! We always ship in discreet, plain package – nobody will know the contents. Choose Your Phytoceramides Savings Package! Phytoceramides Premium™ was designed to help improve your skin with the best quality Phytoceramides extract available. We are providing a 90 day 100% money back guarantee, so you can feel confident that Phytoceramides Premium™ will work for you. To help rejuvenate your skin we have several different savings packages to offer. We recommend trying Phytoceramides Premium™ for 6 months. The savings in the long run will be well worth it.